An aromatic, hearty, smooth curry with a medley of vegetables and rich coconut milk with herbs makes for the heartiest meal ever! Plus the easiest ever homemade green curry paste using homegrown herbs. 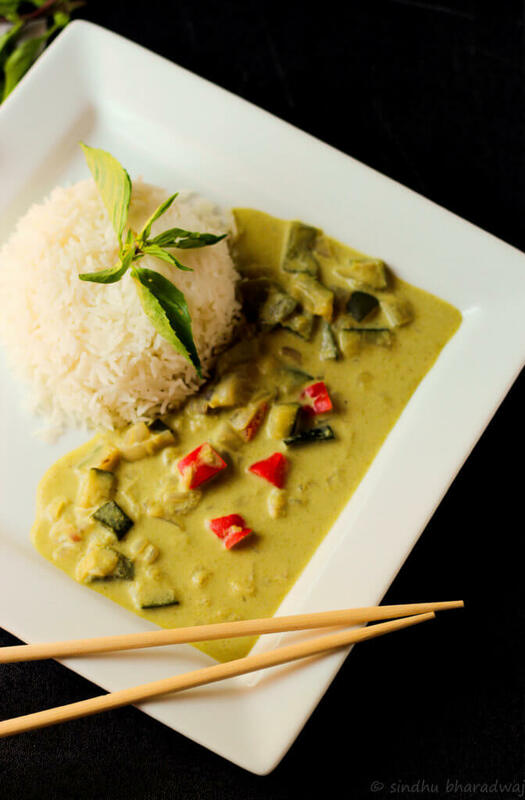 This recipe for Thai Green Curry with Vegetables is a winner with a bowl of steamed rice. The very first time I tasted Thai Green curry was at this restaurant called Nobel House in Jayanagar, Bangalore. Smooth, rich and so fragrant with jasmine rice, I would order the same thing everytime we went there. So saddened that the restaurant shut down a year ago. My love for Thai cuisine started while we were in the US and the closest Thai restaurant- Lime Leaf, was just a mile away where we’d indulge in the best Thai Basil Fried Rice Ever! Not to mention that the closest to spicy food in US was Thai aside of Mexican. Even Indian food was bland at Indian restaurants! The subtle citrusy fragrance of lemongrass, the sweet aroma of Thai basil and the blend of ginger/galangal and coconut milk.. It can transport you to a different world. 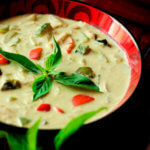 I enjoy every bit of Thai green curry more than yellow or Red, and so does the husband. Did you know? 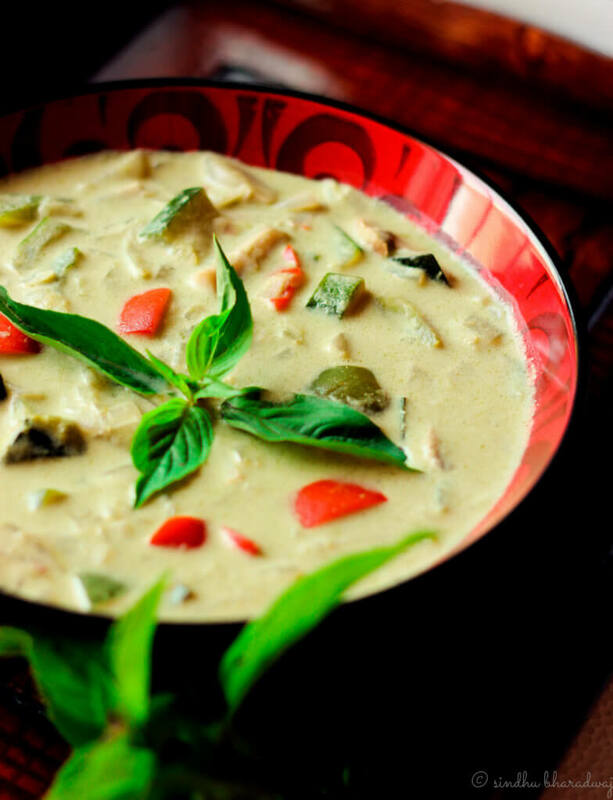 Thai Green Curry originates from Central Thailand and was invented during Rama 6 reign? The Central region is the most abundant with natural resources, and therefore there are many more recipes here than other regions. It has two different styles of cooking: palace cuisine, which is more delicate and decorative; and local cuisine which is more simple. 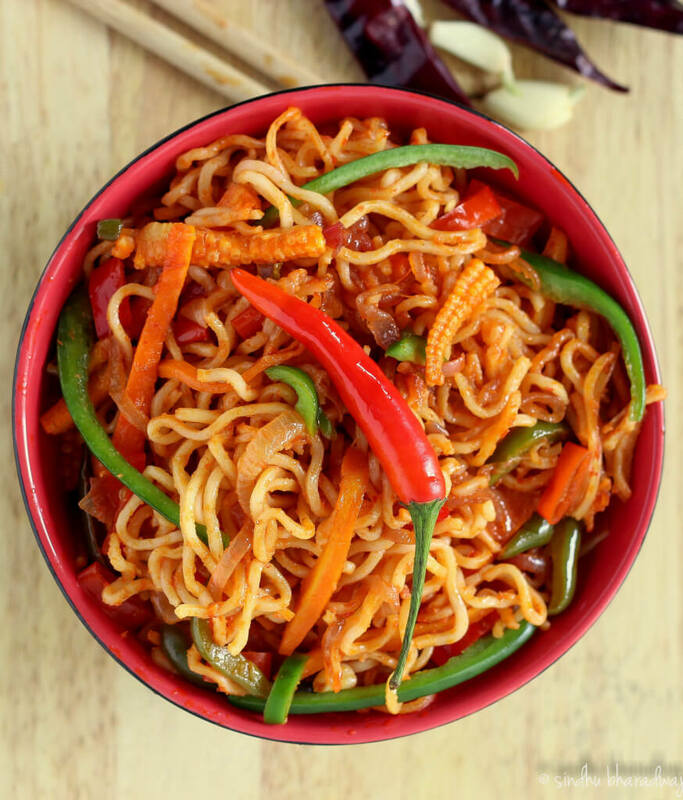 The main characteristic is its balance of the five different tastes, and its use of various herbs and spices. There’s so much more about Thai food and culture you’d want to know that is so much intriguing. But you’ll run out of time and patience to read it all here 🙂 so stay tuned until I post more stories about Thai food, culture and cuisine in my posts ahead. 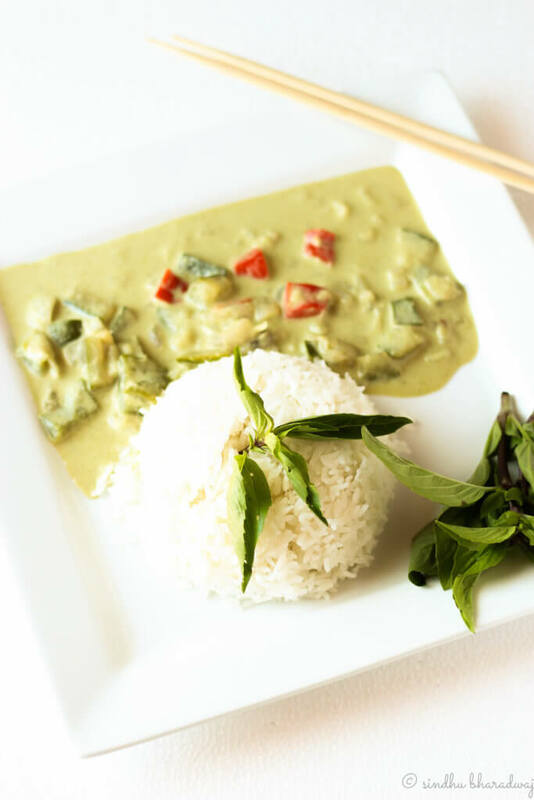 The original and authentic Thai green curry uses chicken, fish sauce and a few other regional Thai spices and herbs. 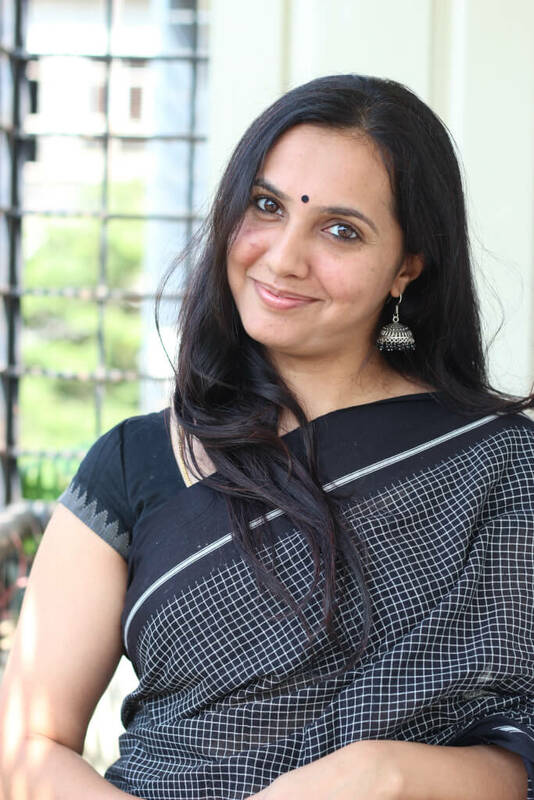 Since this is a vegetarian blog, you are more than welcome to use meat(preferably chicken) and make your variations to it. 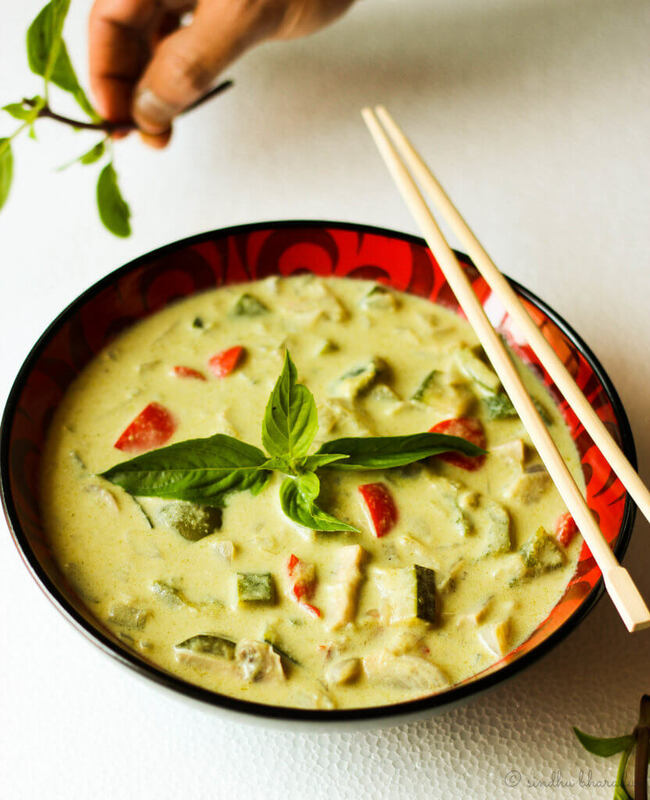 This recipe for Thai green curry with vegetables is so simple that you can actually make the curry in about 30 minutes if you have everything ready. In a pan, heat a tsp of oil and add the onions, garlic and basil. Roast till they slightly turn brownish. Combine it with the rest of the ingredients and grind to a smooth paste with very little water. It should resemble the chutney. In a wide bottomed pan, heat remaining oil and add onions, saute them till they turn translucent. Add the rest of the vegetables and stir fry for 5-7 minutes on medium flame until they turn slightly tender. Now add the ground paste and toss the veggies until they're well coated with the paste. Add in the salt and coconut milk. At this point, you may add half a glass of water if it is necessary (don't do this if the curry seems to be thick). Bring to a boil on medium flame and then simmer it for 3-4 minutes. Garnish it with more basil leaves if you wish. 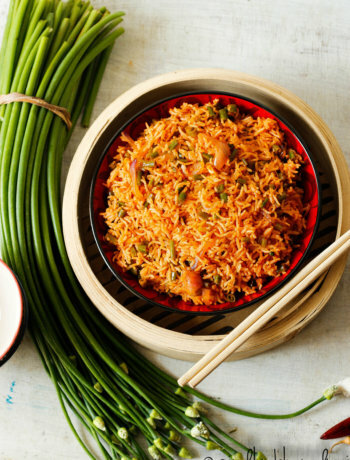 Serve it hot with jasmine rice. You may add tofu as well with the vegetables. Ensure you add it in the stir-fry stage. Coconut milk is a must for this recipe. 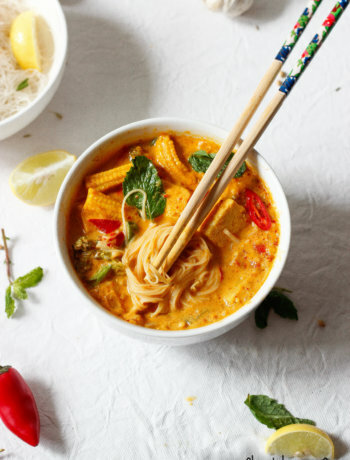 If at all you run out of coconut milk even after adding it to the curry, you may add 1/2 a cup of skimmed boiled milk.